• Unique “Application” capture mode allows you to capture all visible windows of the foreground application with one click. 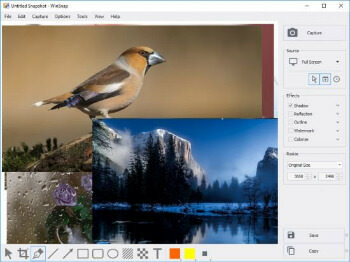 • Unique “Multi-Object” capture mode allows you to select multiple windows on the screen and easy combine them into one screenshot. WinSnap 5 is the next major update of our popular screen capture app. Main improvements include: pixelate tool, advanced resize feature, configurable outline and shadow effect for shapes and text, redesigned user interface and much more. Here is the new default Light UI style. Quick demonstration of new text effects and pixelate tool. WinSnap 5 is free for all registered users – just download and install it! If you prefer WinSnap in a language other than English, please wait for upcoming 5.x releases. Language files need to be updated too.